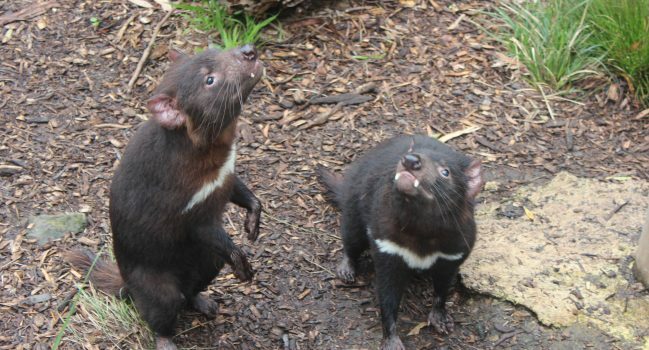 Scientists from many fields are working hard to find ways to help the Tasmanian devil survive. This animal is the largest surviving carnivorous marsupial in the world. It lives in the wild only on the Australian island of Tasmania, where it hunts live prey but more importantly, it is a vital scavenger. With its especially strong jaws and sharp teeth, the devil can rip apart a carcass in minutes, chewing and even swallowing the bones as well as the meat. In 1996, field researchers began seeing devils in the northeast of the island with terribly damaged faces. Before long, more and more devils were affected and the population began to drop. Alarmed scientists discovered that these animals were suffering from a fatal disease that was decimating the population. In 2016 I traveled to Tasmania to learn about this special animal and meet not only the animals themselves but many of the scientists studying the disease and its victims and working to help it survive. 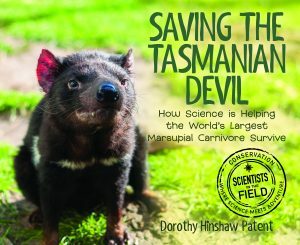 The result of my trip is my book “Saving the Tasmanian Devil,” to be published in 2019.